Try out these crispy bite size samosas made with roti strips. The process of making is a bit tedious but when you get to taste them you feel it is worth the effort. These can be made with veg or non veg filling. You can easily freeze them too. Coriander powder ..... 1 tsp. Dry mango powder .... 1/2 tsp. Turmeric powder ...... 1/2 tsp. Red chilli powder ........1 tsp. 1. Fry the onions to a golden brown colour. 2. Add the mince and all the spices, salt and saute it adding a little water till done. It should remain dry. Add the coriander leaves and let it cool. 3. Now prepare the dough. Just add salt to the white flour and knead it. 4. In a small bowl mix oil and white flour in equal proportions. 6. Roll out 4 small rotis from the prepared dough. Apply the white flour-oil mix on each, place the other one on top. Roll together all the 4 rotis. 7. On a hot griddle quickly semi-roast the rotis. Cut them into long strips and seperate them. 8. Fold each strip into a triangular shape and fill it with the prepared mix. Bind it using the paste. Deep fry and serve hot. For variation you can use any other filling like aloo, paneer etc. etc. Wow i have never made pastry for samosa like this. Have bookmarked to try them. 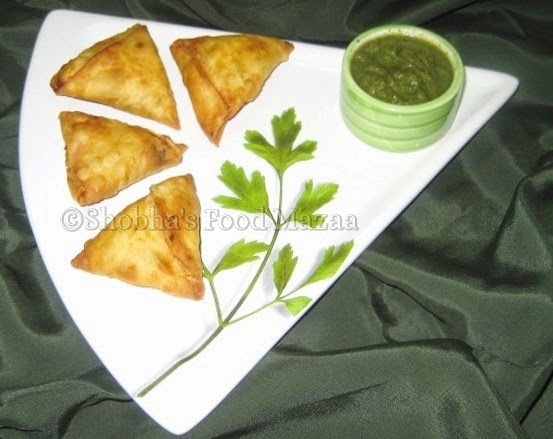 These samosas are very crispy and light too....compared to the other samosas.....though the process is little tedious.I am sure you will love them. Thanks Susheela for visiting my blog and your comments are so precious to me. I am glad that your family likes these samosas. I made the pattis and wrapped them in clingfilm a day before. With the filling and pattis handy I can make the samosas whenever needed.Yes we had samosas for a whole week! Aruna Misra. You make samosas in a very authentic way which I like. Ready made pastry never tastes as nice.